I found this card by krista824 on SCS and just had to case it. I made just a few minor tweaks. Such a fun and happy card! I'm going to spend some time in my happy place again today - my stamp room! Can't wait to create some more! and I want to get off! Life has gotten much busier for me since going back to working full-time in the fall. But March is always an especially month even without work. Both of my boys have birthdays in March, my son Nick has a Futsal tournament(like soccer) one weekend, my son Sam has a gymnastics meet another of the weekends, we have birthday parties for the boys, hockey games on the weekends for my husbands, Stampin' Up! events(especially with Sale-a-bration!) and life! Did I mention I'm working full-time? I'm hoping things slow down a little bit after March is over. Whew! I did have a Stampin' Up! party at Colette's house this past weekend. She asked that we make a card with the Morning cup stamp set. I haven't touched this one for awhile because I was playing with other stamping toys but I was happy to put it to use again! Here is the make-n-take we made. It was my youngest' Sam's birthday yesterday. He turned 11. We bought this totally yummy torte from Cub Foods. We aren't usually cake people but it was so moist, and the frosting was bettercreme with oreos. So yummy and all for only $3.99! It was just the right size to cut up in small little pieces for our family of five. I love it when Stampin' Up! teams stamp sets with coordinating punches! I've been having fun with the create a cupcake stamp set and build a cupcake punch and now I've been playing with the Build a Blossom stamp set and punch. Fun stuff. Woot! It felt good to slip in a little stamping time last night. We're running every night bringing the boys to their sports stuff. It felt good to have a night off. I got to watch Survivor too. Love it! I never used to be much of a vintage girl but the look has gotten so popular and the sets so wonderful that I have really come to love the look! 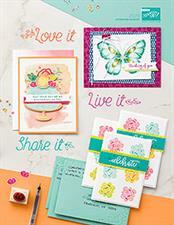 The Sale-a-bration stamp set, Bliss, is a vintage lovers dream! I Cased this beautiful card from the wonderfully talented Mary Brown, aka stampercamper. I love this color combo of Cajun Craze and Rich Razzleberry together! We finished up working on my son Sam's Science Fair project tonight. As much as you have your student do their own project, the parents end up being very busy and involved with it too. My husband did the experiment and documentation with Sam and my part was making the board with Sam and making it look neat and presentable. Crafting supplies really come to the rescue at a time like this! I broke out my wonderful quality Stampin' Up! cardstock and Sizzix die cut letters to do the trick. It's a relief that it's over. Until next year, when he has to do an engineering project. He thinks like an engineer so hopefully that project will be easy for him! I try my best to stay up with technology. I really do. But it frustrates me sometimes. I was trying to take a picture of some cards to post on my blog yesterday morning with our new camera. I was getting frustrated because I couldn't see an image of my card, just black with the settings at the top. I complained to my husband last night about it and he called me over to the camera. Is this what you were seeing? I said yes. He said, "you left the lens cap on." I have to give him credit for not making fun of me. I went lens cap free today and got some photos of some cards to share with you. These are the cards that were make-n-takes at my Open House this past Sunday. This uses the new Sale-a-bration stamp set, "Punch Bunch". Pretty quick and easy. I cased and tweaked a card by Tessa on Splitcoaststampers.This set is called So Happy For You. This set was the run-away hit at my Open House! This last card was inspired by Passion Flower on Splitcoaststampers. I loved her color combo. Sale-a-bration begins and more swaps to share! 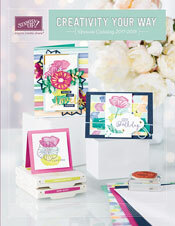 Yesterday, January 25, was the start of Sale-a-bration, Stampin' Up! 's biggest promotion of the year! I look forward to this all year long!!! Our biggest sales event of the year--Sale-A-Bration--is here! This year we've got four great Sale-A-Bration sets for hostesses and customers to choose from--as well as a Designer Series Paper & Quick Accents pack, a Ribbon & Button pack, digital downloads, and Décor Elements! Spend: customers will receive a free Sale-A-Bration product for every $50 they spend (before tax and shipping)! Host: hostesses will receive a free Sale-A-Bration product for every $300 in workshop sales*, in addition to our regular hostess benefits! *Note: This benefit is only available on qualifying customer, demonstrator, and workshop orders. Online orders do not qualify. Join: New recruits will receive 15 percent off their Starter Kit (Standard or Digital+), plus a special Sale-A-Bration bonus bundle valued up to $50! *The Stampin' Memories Add-On and Definitely Decorative Add-On can be added to these kits, but will not be discounted. Aren't I lucky to receive such great swap cards? I don't have time to chat - must dash to work.